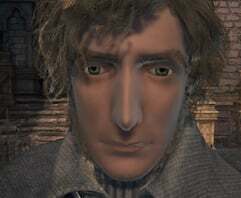 Alfred is a non-playable character in Bloodborne. "You're a hunter, aren't you? I knew it. That's precisely how I started out!" This character can first be found at the Cathedral Ward, in another part of the building with the tomb entrance. Go on the left side of the building around to where you pull the lever to open the tomb. Continue out the door and he will be standing there. He will give you Fire Paper during this encounter. 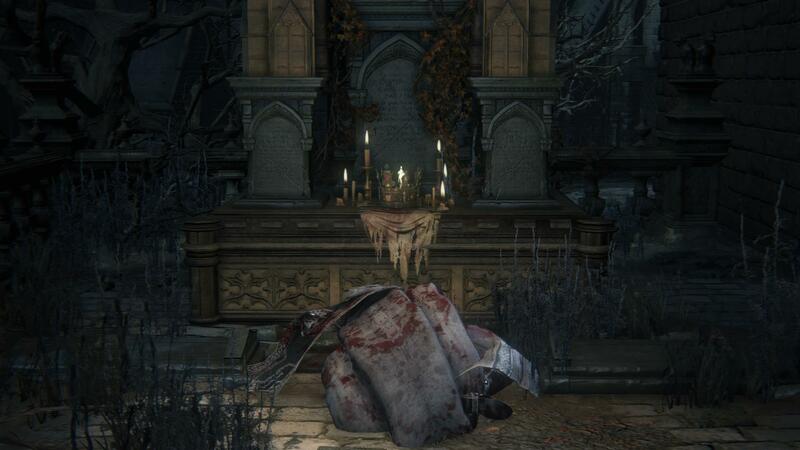 Later in the game, after killing Vicar Amelia, he can be found again in the Cathedral Ward, but on the balcony overlooking the entrance to the Forbidden Woods. 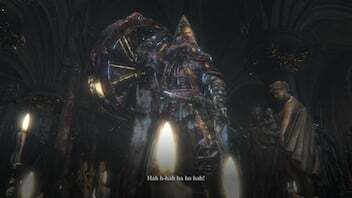 Can be summoned outside of the Blood-Starved Beast fight if you spoke to him previously in Cathedral Ward. As you descend towards the chapel on the first staircase you will find a note on the right-hand side saying that you can summon him. Use the Beckoning Bell on the note and he will be summoned. Alfred does not fill a summon slot. If he is summoned first, it is still possible to summon two players, allowing you to tackle Blood-Starved Beast with a four-man team. Can be summoned for the Cleric Beast, you must have agreed with him in the Cathedral Ward. To summon him go through the gate next to the Central Yharnam lamp, down the stairs and there will be a messenger with a note, use the Beckoning Bell there. Drops: If killed in his second location in Cathedral Ward, he will give Wheel Hunter Badge (replaced by Fire Paper if you already have the badge), as well as Radiance oath during Vileblood Queen Chamber encounter after talking to him there. If you kill him in the first location, he will only drop Fire Paper. After defeating Martyr Logarius in Cainhurst Castle, Pick up the Crown of Illusions lying nearby on the ground. When equipped in this location activates a quick cutscene that reveals the Vileblood's throne room. To the right of the queen and on a table lies the unopened summons letter. Deliver this summons to Alfred near the Forbidden Woods entrance in Cathedral Ward so that he will gain access to Cainhurst, You will receive Church Bow (Male) Gesture and Wheel Hunter Badge. Alfred's mission is to eliminate the Vileblood faction for the sake of his former master to become a "true martyr" and to do this he must kill the queen. Once given the summons, Alfred will be found in the Vileblood's throne room standing over the queen's mutilated body, Talk to Alfred here to receive the Roar Gesture. Inspect the Queen's throne to get Queenly Flesh. Upon further inspection her remain's "writhe eerily" and you can see them pulsing slowly. 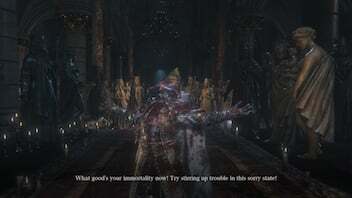 Return to first location you spoke to Alfred, near the entrance to Old Yharnam in Cathedral Ward, to complete this quest, You will find his body along with the Radiance rune. It is believed that after completing his mission to eradicate the Vilebloods, Alfred took his own life to become a martyr just as his master was. An alternative theory is presented in the notes. You're a hunter, aren't you? I knew it. That's precisely how I started out! Oh, beg pardon, you may call me Alfred. Protege of Master Logarius, hunter of Vilebloods. So, what say you? Our prey might differ, but we are hunters, the both of us. Why not cooperate, and discuss the things we've learned? "Beast hunting is a sacred practice. May the good blood guide your way." Refuse: Nothing happens. He will just bid you farewell and you can talk again with him to cooperate. There must be oodles for us to share. "As you know, the Healing Church is the fountainhead of blood healing." "Well, I'm a simple hunter, quite unfamiliar with the ins and outs of the institution." "But I have heard that the holy medium of blood healing is venerated in the main cathedral. And that councilors of the old church reside in the high stratum of the Cathedral Ward." "If you seek blood healing, and the church is willing, you should pay them a visit." "Byrgenwerth is an old place of learning. And the tomb of the gods, carved out below Yharnam, should be familiar to every hunter." "Well, once a group of young Byrgenwerth scholars discovered a holy medium deep within the tomb." "This led to the founding of the Healing Church, and the establishment of blood healing". "In this sense, everything sacred in Yharnam can be traced back to Byrgenwerth." "But today, the college lies deep within a tangled wood, abandoned and decrepit. And furthermore, the Healing Church has declared Byrgenwerth forbidden ground." "It's unclear how many of its scholars remain alive...but only they know the password that allows passage through the gate." "Once, a scholar betrayed his fellows at Byrgenwerth...and brought forbidden blood back with him to Cainhurst Castle." "But all did not go well and Master Logarius became a blessed anchor, guarding us from evil...Tragic, tragic times...that Master Logarius should be abandoned in the accursed domain of the Vilebloods." I bid you farewell. It has been a pleasure. May the good blood guide your way." "Ah-hah! Is that... the sigil of Cainhurst?" "Wonderful! I thank you profusely... I will depart immediately. But first, a token of my gratitude." "Ahh, I feel my master's hand at work. Praise the good blood! And let us cleanse these tarnished streets." It has been an honor, but I must say good-bye. Let us cleanse these tarnished streets. And may the good blood guide your way." "Master, look! I've done it, I've done it! I smashed and pounded and grounded this rotten siren into fleshy pink pulp!" "There, you filthy monstrosity! What good's your immortality now! Try stirring up trouble in this sorry state! All mangled and twisted, with every inside on the outside, for all the world to see! He heh hah hah Hah! He heh heh ha ha ha ha!" "Oh, you, is it? Look at this! Thanks to you, I've done it! Well? Isn't it wonderful?" "Just what is the meaning of this? Why turn your blade on me? You're jealous, aren't you? Unclean wench! Vile monstrosity! Bloody fool! Has the blood gone to your head? Pathetic, as you deserve!" Pray for Master Logarius... in my stead..."
Although Alfred is a hunter he is wearing the Executioner Garb which suggests that executioners were once used as hunters. 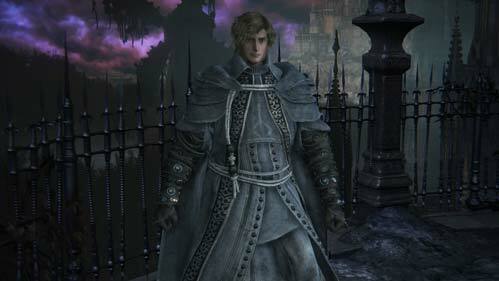 Alfred may be an Executioner and a hunter; or the Executioner order was disbanded after Logarius' martyrdom, (there is no chance that Alfred left the order willingly as he expresses deep love for his master and he is willing to take over his duty and hunt down the last Vileblood). In any case, Executioners were used to hunt down individuals possessing the "tainted" blood of the Cainhurst Vilebloods. Alfred is voiced by Daniel Flynn, the same voice actor as Solaire of Astora from Dark Souls, Alfred even speaks the phrase "Praise the Good Blood" upon giving him Unopened Summons. You may safely give him the Unopened Summons if you have joined the Vilebloods and equipped the Corruption Oath without him becoming hostile. Killing him after he has given you Roar will make him drop the Radiance Oath. Alfred completely tears the queen's body to pieces and this is most likely because he knew that she was undead and would not die from normal wounds. It seems after giving him the Unopened Summons... if you attack him (Need not kill him) he will not murder Queen Annalise. Resulting in receiving the wheel hunter badge and gesture but not killing Annalise. Also if you kill him at this point he will not drop anything, however, the Gold Ardeo will still be available for purchase at Hunter's Dream. When you find him he is praying in front of a statue that seems to be wearing Executioner's set. He has performed a strange ritual and there is blood on the altar in front of him. A close-up of his eyes reveals that his pupils are beginning to "collapse". This is a sign that he will soon fall to beasthood. He drops a Blood dreg after he kills the Queen. Why do people always bring this worthless dullard along for BSB? Compared to Gehrman&apos;s eyes, Alfred&apos;s look quite normal. For the grace, for the might of our blood, for the home of the good blood. The one portion of his dialogue that still confuses me is when he mentions a Byrgenwerth scholar that betrayed the school and brought "forbidden blood" back to Cainhurst, creating the Vilebloods. B. WHAT was this "forbidden blood?" Is Alfred implying that it was forbidden by the Healing Church, by Byrgenwerth, or by both? C. WHEN did this happen? Prior to the establishment of blood healing? If so, why would they enlist the help of Lady Maria if she was a Vileblood? If after the events of the Old Hunters, does that mean Byrgenwerth was still in operation up until recently? D. Lastly, WHY did this scholar bring forbidden blood to Cainhurst? Now that I think about it, when exactly did Cainhurst ever become involved in all of this, anyway? 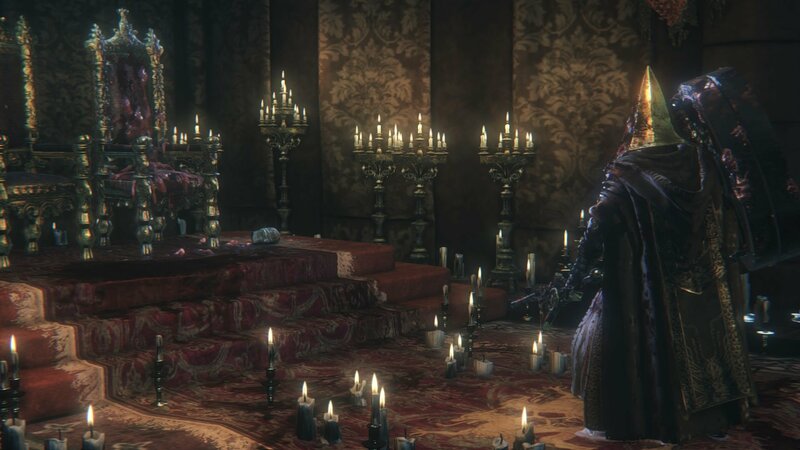 Did Cainhurst exist prior to Byrgenwerth? Is Byrgenwerth descended from Cainhurst, based on the store of knowledge in their grand library, or do they just share common interest in the Tomb of the Gods? Was Cainhurst ever allied to Byrgenwerth, or was there some sort of race to discover the eldritch truth? How did a certain type of blood somehow create the Vilebloods, yet not turn these individuals into beasts like every other sanguine illness in the game? I feel rarely real anger towards a npc...or joy killing one. Thanks Alfred to grand me such a rare moment. He doesn&apos;t start by saying "You&apos;re a hunter, aren&apos;t you," he starts by saying "You&apos;re a BEASThunter, aren&apos;t you?" He&apos;s still a Hunter, but apparently he doesn&apos;t care about beasthood, perhaps because he&apos;s a member of the Healing Church, and most of its members are beasts anyway. I wonder if Alfred still perceives them as humans? I was so damn sure i&apos;d summoned him for Amelia on my first playthroguh. Alfred&apos;s eyes are not collapsed, just green. Green, of course, being a natural eye colour. KIlled after he smashed Annalise. Pretty fun. Too bad I didn&apos;t get to see how much blood echoes he dropped. Alfred isn&apos;t available for BSB if you killed Amelia Vicar first. has nobody really noticed that awhen summoning alfred against the BSB he appears as "old hunter - vileblood hunter alfred"?it doesn&apos;t say vilebloodS hunter, like it would in case ofor example of "hunter of hunters"
does that mean alfred was once a vileblood and then betrayed them to join the executioners? Interestingly, when he commits suicide at the end of his questline, a Crown of Illusion appears on the altar in front of him. In the notes it says that attacking him (yet not killing him) after giving him the summons will result in him not killing the queen. Do I have to aggro him or simply slice at him a couple times? I killed him when he was on the balcony just before you go down that door. It took me three tries and in the end I realised I wouldn&apos;t have been able to kill him normally so I ran down the stairs opened the door and found out that he physically cannot enter it. So all I did was stand inside, wait for him to walk back up the stairs then take a step outside and do a charge attack which he always runs into. It took me like a minute and then I got the wheel hunter badge. I did it because someone told me if you use him in the fight against the bloodstarved beast and he dies, the only way to get the badge is to kill him.